The purpose of bedding is to mate action and stock together. This process ensures that there is no movement under recoil, however, care must be taken not to create tension in the metalwork which causes inconsistent vibrations. We have tight maximum tolerances on bedding stress which are easily measured with a 0.001″ dial indicator. All barrels are left fully floating. Actions are bedded using a pillar bedding system with Marine Tex or Bisonite. 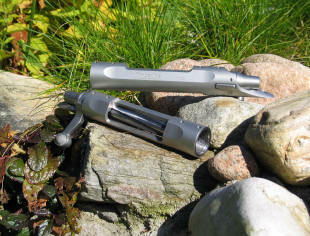 The pillars are either of machined aluminium or epoxy depending on the depth of the stock at each of the action bolts. Grooves are machined on the circumference to give a good epoxy bond between the stock and the pillars. No direct contact is made between a metal pillar and the action as it is extremely difficult, if not impossible, to get a perfect fit between solid pillars and an action while maintaining an evenly distributed contact on the remainder of the bedding surface.